I have been creating fused glass since 2010. 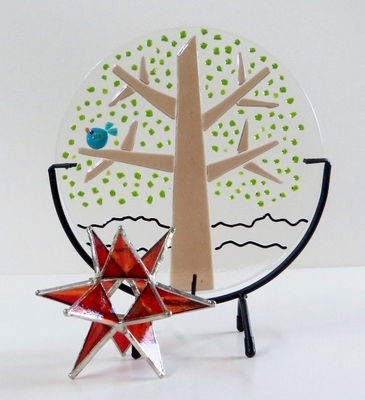 I started out creating stained glass pieces but soon discovered a freedom in fused glass that is more enjoyable for me, although I have found a way to combine the two that can be pretty fun too. Not only can I create more unique pieces with fused glass, but I have found a joy in creating small detailed pieces full of whimsy and color. I have a glass kiln where every piece I make finds itself at least once and sometimes several times until I get just the finished piece that I have envisioned. I find this process both exciting and frustrating, that being said, I find that I am always anxious for the next batch to be fired. I love creating with glass, I find it relaxing and fun and my goal is to bring a smile to someone’s face.